After making soft pretzels, I can see why they're perfect for parties! The ingredients are incredibly inexpensive and once the dough has risen, it's so easy to just cut up some strips, lay them out for guests and let them start forming the pretzels. Don't be skimpy on the salt because it tends to absorb after you've dipped the dough in boiling water and baking soda. The pretzels only take about 8 minutes to bake and taste best when they're fresh out of the oven. Serve them with some German beer and various mustards, such as this spicy mustard from Emeril Lagasse. You'll need to start the mustard a day in advance and once you realize how simple it is, you may stop buying it from the store! If you want it less spicy, then cut down on the brown mustard seeds and add more yellow. 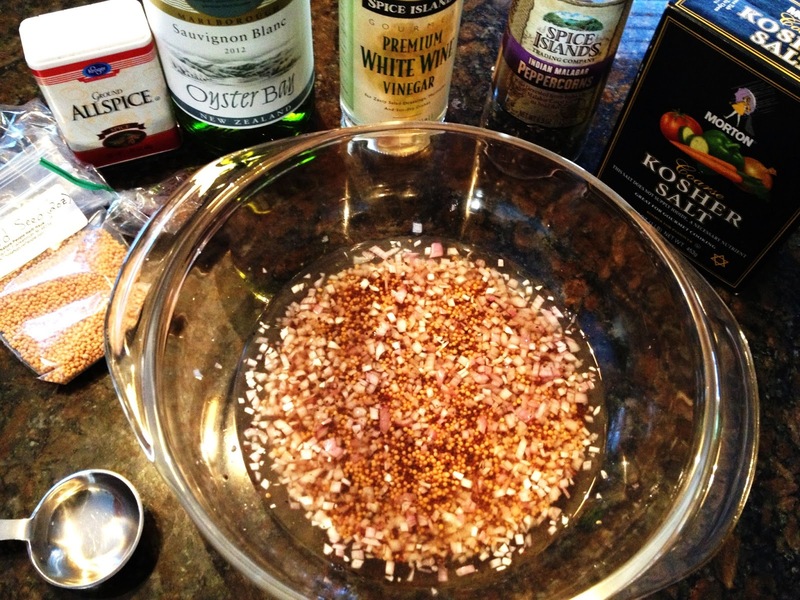 - In a small bowl, dissolve yeast and 1 tsp of the sugar in warm water. - Let it stand for 8-10 minutes, or until the mixture begins to foam. - In a large bowl, mix the flour, 1/2 cup of the sugar and salt. - Make a well in the center and add the yeast mixture and vegetable oil. - Mix and knead the dough until it's smooth (about 7-9 minutes). The texture should be slightly tacky. If it feels too dry, then add 2 Tbs or more of water. - Form into a ball and place into a large bowl lightly coated with vegetable oil. - Turn and coat the dough in the bowl and cover with plastic wrap. - Let the dough rise in a warm place for about an hour, or until it's double in size. - When you're ready to make the pretzels, pre-heat the oven to 450. - In a large saucepan, bring 5 cups of water to a boil and dissolve the baking soda. - Keep a lid on the saucepan and reduce the heat to a simmer. - In the meantime, turn dough onto a lightly oiled surface and divide it into 10-12 equal pieces. 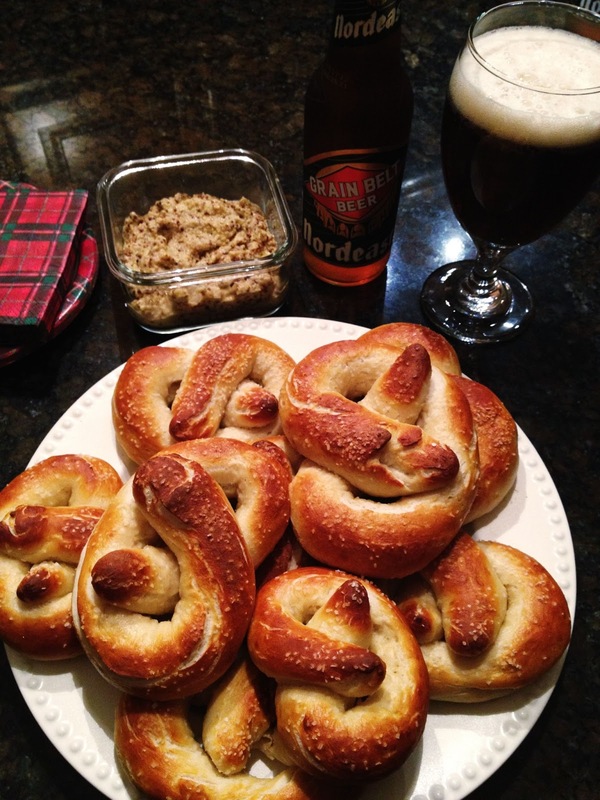 - Roll each piece of dough into a long, 1/2 inch rope and form into a pretzel shape. - Using a large, flat spatula, dip each pretzel into the boiling water for a few seconds and place onto the baking sheet. - Sprinkle generously with kosher salt and bake for 8-10 minutes, or until they're golden brown. - In a non-reactive bowl, add all the ingredients, cover and refrigerate overnight. - Transfer the mustard mixture to a blender and process until you have the desired texture and thickness. Ours was pretty chunky, which we preferred. - Store in an airtight container and this stuff will last up to 2 weeks.